My third trimester is fast approaching and I am in full blown divide-and-conquer mode to get ready. I can’t believe how fast it’s gone by– and at the same time, I can’t believe I just said that because I feel like I’ve been pregnant forever and like I still have forever to wait until I meet my kid. Wibbly wobbly timey wimey. I’ve been working my way through photos from a wedding I did a couple weeks back. One of these days, I’ll throw a few more photos up here and see if I can’t get back on the P365 wagon. 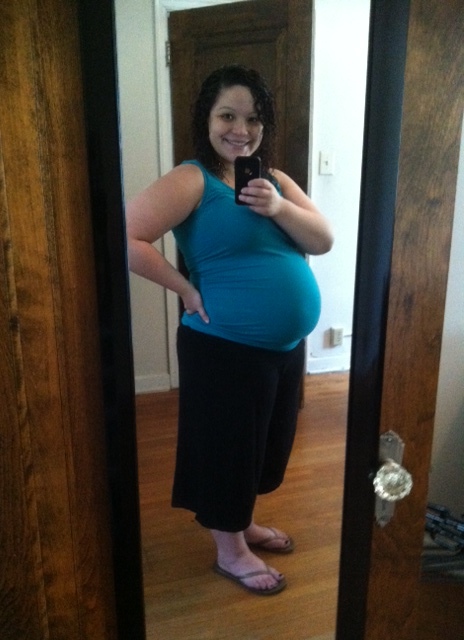 Until then, you get another super low quality cell phone photo of my enormous belly. Baby is the size of: a head of lettuce. Holy crap. No wonder my belly is enormous and the acrobatics are killing me. Loves: brats and corn on the cob with olive oil, salt, and pepper as grilled by my Father-in-law (seriously, YUM! ), my maternity swim suit (random, but true), SWIMMING (feeling weightless right now is amazing), sweet tea, buying baby clothes at garage sales and thrift stores, watermelon, cantaloupe, Frozen Strawberry Lemonades from McDonald’s. Hates: hip pain, rib pain, chest pain, back pain (seeing a theme? ), gaining weight (sorry ladies, it’s true), and all weird things my body is doing in response to all my crazy pregnancy hormones. Seriously– the answer to most questions. Why does it feel like somebody shredded the bottom of my feet with a thousand tiny razors? Hormones. What’s with the random spot on my leg that’s been numb and itchy for four months? Hormones. How did I get these random bumps on my skin? Hormones. Being pregnant is so weird. But it’s worth it. So worth it.